One Piece - Rozdział 927 -Spoilery | One Piece! Cytat: Kyoshiro's henchmen are beaten up by Sanji and Franky because they wasted food. 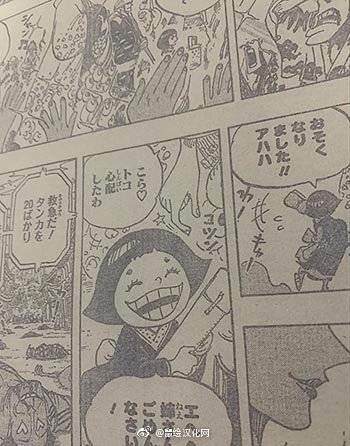 Cytat: Orochi appears as "dragon" silhouette in this chapter. In the cover page, Garp and a bear are wrestling for salmon. Cytat: Robin, Usopp and Franky are in Sangoro's Soba Cart Cook. All customers in cart cook are woman/okamas. One of Kyoshiro's henchmen kicks Sangoros' soba pot and other drop a little girl soba bowl. Sanji kicks one of Kyoshiro's henchmen and Franky attacks other one with a suplex. Sanji give a new soba bowl to the little girl, she's very happy. After eating it, se left Soba cart cook. That little girl works for Komurasaki, the Top Idol in Wanokuni. The Kyoshiro's henchmen that scape from Sanji arrives to Kyoshiro house, and tell him what happend. Frannosuke, Uso Hachi, and O-Robi are gathering at Sangorou's soba stand. They are eating noodles and chatting. Apparently Sangorou and Furanosuke gave those hooligans a lesson. Kyoshiro heard that his henchmen are beaten up, but he's at Orochi's banquet and it was inconvenient/improper for him to leave, so he entrusted Queen to send assassin(s) to take care of it.